It is vital that you check with your manufacturer what capacity should be put on your car. In some cases your insurance can become void if you select the incorrect tyres. 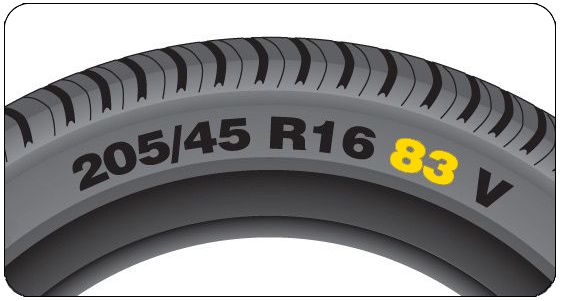 The load rating is generally found after the diameter reading and before the speed rating on the sidewall marking. So the example on the right shows a load rating of 83. So using the table below we can see that 83 would refer to a load capacity of 487kg, most passenger vehicle load indexes range from 62 to 126.